I recorded a radio interview yesterday. We talked a bit about the theme of my new book. Sofia’s Tune has a musical theme to be sure. Antonio is a vaudeville pianist and church organist who dreams of becoming a concert musician. 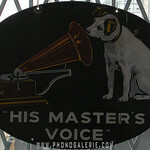 Sofia’s eccentric aunt harbors some records with the emblem of his master’s voice. And, everyone thinks Antonio’s dog resembles the dog on the labels. He is such a loyal pet, always listening for his master’s voice. There is a famous musician in the story. He would have been in New York City around that time, and he meets Antonio in a manner that he probably met other struggle musicians. There is also a family heirloom of sorts. An instrument that Antonio’s father, who had wanted his son to become a musician, had brought over from Italy. And Antonio lives in the building on Varick Street that formerly housed the Steinway & Sons piano manufacturer. So that’s Sofia’s Tune on the surface. Very musical indeed. This entry was posted in dogs, Ellis Island Series, His Master's Voice, Sofia's Tune and tagged Ellis Island series, His Master's Voice, Sofia's Tune on October 9, 2015 by cthomson.